Thomas was born in 1886 and the 1901 and 1911 Census both show him living with his widowed mother Kate in Houghton Street, Rainhill. 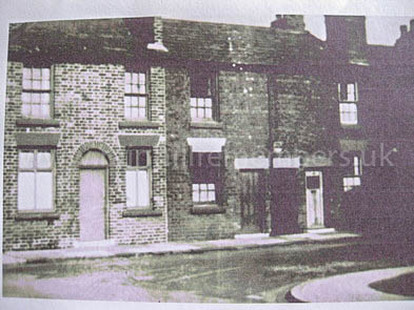 These houses were at the station end of Houghton Street and together with the rest of the houses were knocked down around 1970. He enlisted on 4th November 1914 in St Helens at the age of 28. Thomas’ occupation was given as a “brass worker” on the 1911 Census but on enlistment this had changed to “upholsterer”. He served at home from 4th November till 11th December 1914 after which he was part of the British Expeditionary Force sent to France. However on 4th March 1915 he was returned home having been wounded by a grenade. After this, he was moved by sick convoy to No 2 Clearing Hospital and then by train to No 8 General Hospital and finally to England. Army records indicate that he did not return to France and was demobilised on 4th January 1919. Records show that he received the 1914-1918 Star Medal, the British War Medal and the Victory Medal.